"FONTANA GRUPPO. 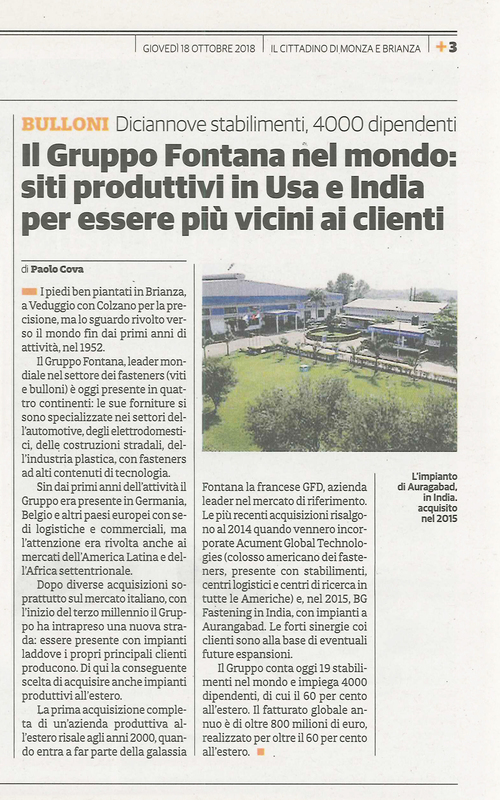 FASTENERS SOLUTION PROVIDER PER COSTRUZIONI E INDUSTRIA"
"IL GRUPPO FONTANA NEL MONDO: SITI PRODUTTIVI IN USA E INDIA PER ESSERE PIÙ VICINI AI CLIENTI"
"L’ALLEANZA GOOGLE E SALESFORCE CONVINCE IN ITALIA"
"ATTIVATA ANCHE IN ITALIA LA PARTNERSHIP TRA GOOGLE E SALESFORCE"
"SALESFORCE SCEGLIE GOOGLE PER PORTARE IL CLOUD ALLE AZIENDE ITALIANE"
"PARTNERSHIP STRATEGICA TRA GOOGLE E SALESFORCE"
"GOOGLE E SALESFORCE: UNA PARTNERSHIP STRATEGICA PER PORTARE LA POTENZA DEL CLOUD ALLE AZIENDE ITALIANE"
"FONTANA GRUPPO, UN CRM EVOLUTO PER UNA VISTA A 360 SUL CLIENTE E L'AZIENDA"
"I FASTENERS CHE MUOVONO IL MONDO"
"LA VISITA DEL PAPA COSTERÀ 3 MILIONI. VALLI "SPREME" BANCHE E IMPRENDITORI"